When news breaks, you may instinctively reach for Twitter. And that’s a fine reaction! It’s a good place to start to find sources. (This guide/exercise will show you how to do that very thing). But if you’re looking for more sources and tips, and if you’re generally trying to stay on top of the news, you should consider peeking at reddit and Instagram as well. Reddit can be good for finding eyewitnesses and its crowd-sourced “live-blogs” are also useful. Instagram, meanwhile, can offer a more direct way to interact with your local community. (Note: Before you continue, it may be useful to read this post about using targeted search terms to find sources for all kinds of stories). Reddit consists of a bunch of ‘subreddits,’ or topic sections. The most popular stuff bubbles up to the front page, but each post starts and lives on a specific subreddit. Every post, and every comment on every post, can be upvoted or downvoted by each user. Votes are how the community determines the best content, which rises to the top. There are subreddits for nearly every topic imaginable – from Washington, DC to Male Fashion Advice to Ask Historians to Look At My Dog with a lot of unsavory things in between. You don’t need an account to browse, but you will need an account to comment or contact other users. Note that very few people use their real name on Reddit, but you might consider making your handle indicative of what you do (I am nprserri). You should also know that reddit is a very open forum. There are subreddits for feminism and LGBT communities, as well as those for men’s rights and white supremacists. The subreddits tend to self-regulate but the site’s administrators remain fairly hands off. Very soon after news breaks, a reddit user will usually post an early article about the event in the /r/news and/or /r/worldnews subreddits. These threads can occasionally become a very useful place to find eyewitnesses OR people who know someone near the event. No matter the topic, the most popular reddit posts are those that include first-hand accounts or personal experience. 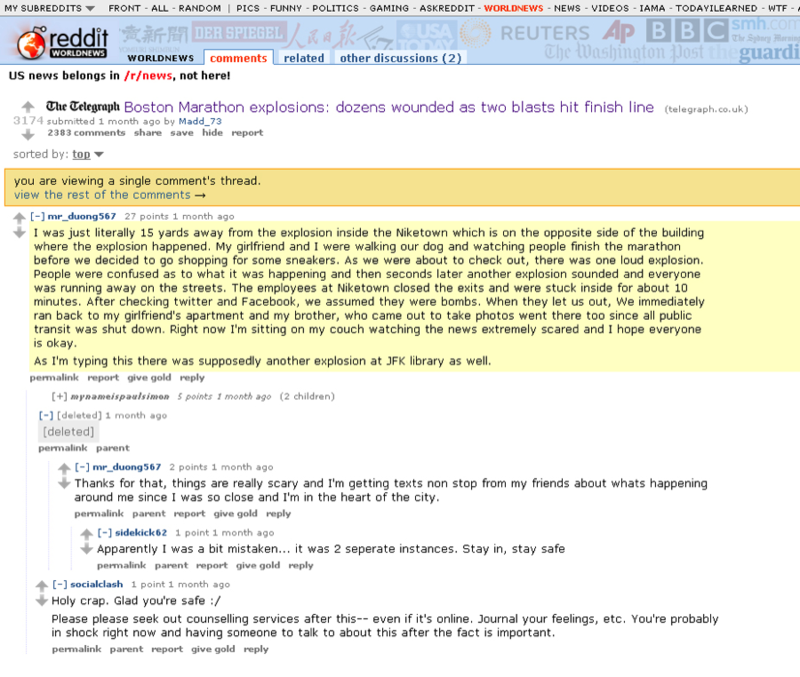 In this Boston bombing thread (screenshot below), dozens of people were commenting about family and friends who were near the blasts. And handful of others said they saw the explosions firsthand. I pulled out the comment thread of someone who was near the finish line. Unlike Twitter, you can send a private message to anyone on reddit as long as you have an account. I clicked on mr_duong567’s username, which pulled up all his recent posts. From there, I clicked on the “send message” icon on the right side of the page. Just like in traditional reporting, the most effective way to find people who will a.) respond and b.) be good on the radio, is to drop a lot of lines in the water until you can get some phone numbers. I’ve found that, generally, people will get back to you quite quickly. Reddit is also useful for following crowd-sourced update threads. In the Aurora, Colo., movie theater shooting and the Boston Marathon bombings, users created minute-by-minute update threads about what was happening, with links to their various sources. The users’ own research was supplemented by suggestions from commenters who were listening to police scanners, watching local TV or near the event. Of course with all things on social media, these can contain deeply flawed information, so use caution. Generally, the author will try to strike-out information that’s later determined to be inaccurate. An Instagram user tipped us off to a video they had taken that captured a violent fight between bouncers and patrons at a Fort Lauderdale Beach bar. The video was soon removed from Instagram, but the newspaper was able to grab it in time. Why this worked: We had been establishing the newspaper’s presence in the local community on Instagram by participating in local hashtags, following locals and commenting on their photos regularly. When the user filmed this scene, he posted it to his account and reached out to local media who were using the platform. Because we regularly monitored our mentions, we caught this and alerted our news editors. The takeaway: Be where your audience is – and engage with them there. By being active in the Instagram community, local users have begun tipping us to news they witness. 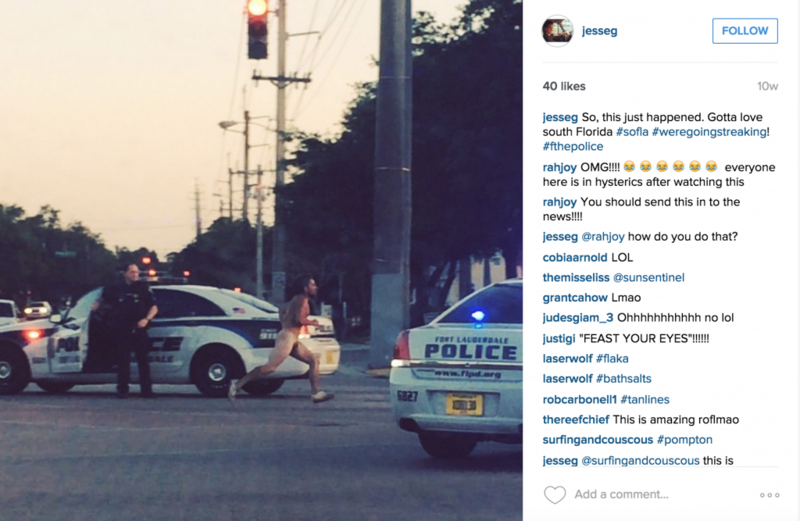 Scrolling though my own personal feed, I came across a friend’s video of this streaker in downtown Fort Lauderdale. I sent the tip in to the news desk, which followed up the following business day at the local police department. It took a day or two for the police department to get us the arrest report, but the reporter’s hypothesis was true: The streaker was high on Flakka, a synthetic drug that was popular in the region. The video allowed her to build out a larger trend piece on the state of synthetic drugs. The takeaway: Follow locals! Alert your news editors to anything in your own personal feeds that might be newsworthy. Start by searching for place-based hashtags, like those for cities and neighborhoods i.e. #Georgetown, #PetworthDC, #Shaw #202 (Area codes). Then look to see if the results you’re getting are specific to that place. Look and see what other hashtags users are using, and follow those. In most metro areas, there are multiple Instagram groups, usually you can find them by using #igersCITYNAME or #igCITYNAME. Washington, D.C. examples: #igersDC and #igDC. Look at location tags. As you’re looking at place-specific hashtags, check out the linked location tags some users put on their images. So, if you find a photo of Union Station that has the location tag on it, you can click on it and see other images that were tagged in that location. There isn’t an official search tool for location specific tags, but you can work around this by using third-party tools like Worldcam. Follow locals. Using the techniques above, be sure to follow plenty of locals. By doing this you can get a nice “pulse” of the city. For example, if there’s a really great rainbow – no joke here – and you open up your Instagram, you should be able to scroll a few times and encounter a number of folks who have posted an image of it. That’s my little test to see if you have a localish following. So, in a news situation– let’s say a huge fire– it’s likely just by using your own Instagram feed, you should be able to log in and come across photos of the fire. As I’ve written elsewhere, with great power and access to information comes great responsibility in verification. It should be obvious, but you have to be very careful when pulling information or sources from social media. It’s so easy to get it wrong. People lie and exaggerate online all the time – and journalists fall for it all the time, too. Look at a user’s profile. Are they brand new to the site? Do they have other connections/friends? If not, you might be skeptical that they are who they say they are. Get a user’s real name and try to vet them with traditional resources, like Nexis. See that amazing image “from the scene?” Run it through Google’s reverse image search. It may be old and, potentially, entirely unrelated (more cautionary tales here). One key is to be transparent about what we’re doing. We tell readers what has and hasn’t been confirmed. We challenge those putting information out on social media to provide evidence. We raise doubts and ask questions when we have concerns — sometimes “knocking down” rumors circulating on the Web is of enormous value to our readers. And we always ask an important question: am I about to spread a thinly-sourced rumor or am I passing on valuable and credible (even if unverified) information in a transparent manner with appropriate caveats? Serri Graslie is the former Senior Digital Strategist on the NPR Training team.